Every job is inspected for imperfections and either rejected for repainting, or wrapped ready for collection. Approximately 1200 jobs pass though our plants in a year. Because of our quality control we are approached only once or twice a year with concerns about our painting and this does not necessarily mean it is faulty. Every aspect of every job has been recorded since 1996 for traceability showing all components with dimensions, thickness, results of tests, colour, manufacturer and batch numbers of the paints used. With this information a certificate of conformity can be produced, even after the job has left our premises. All jobs are cross hatched, this will give an indication of adhesion and whether the paint is cured. 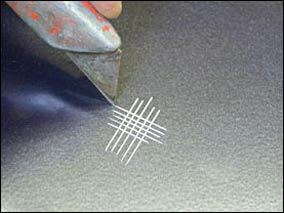 The paint is cut into approximately 2mm squares with a sharp knife. The adhesion of the paint is tested by placing adhesive tape over the area to see if the squares are removed when the tape is with drawn. The test will find film weakness like such as cracks, faults, pin-holes or contamination with in the paint film. The DC Holiday tester uses high voltage to track through areas of low electrical insulation compared to a solid film of paint. Contracted by Blaze Neon the Country's third largest sign maker. In three months Nat West required all their branches to be resigned. Signs for 700 branches were powder coated using a specially manufactured blue metallic supplied by Dupont powders. 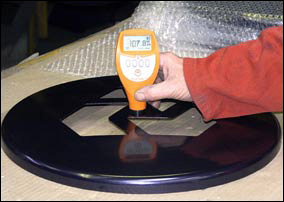 During paint curing many applicators rely on indirect temperature measurement of the painted component. The air temperature in the oven is measured and a calculation or often a guess is made for the time required for the metal and paint to get to the desired temperature. 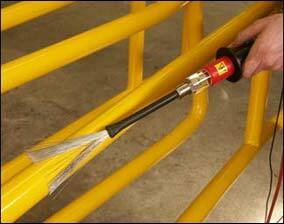 If insufficient temperature is acquired the paint will be brittle and have poor corrosion resistance. All three of Windridge Coatings paint lines use a number of ways to measure the metal directly.